Concluding the list of names for the Beyond Wrestling 8-pack comes two more wrestlers from the renowned Women’s Wrestling Revolution Wrestling Revolution sister promotion. 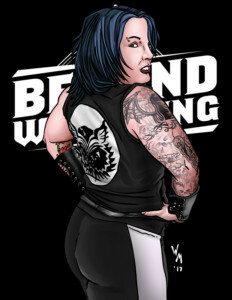 LuFisto has been one of the biggest names in independent women’s wrestling for the past decade, making a name for herself throughout the US and Canada. Jordynne Grace is newer to the independent circuit, but is beginning to branch out and make a big name for herself, promising to be the future of independent women’s wrestling. The powerhouse Grace has had some compelling contests in Beyond Wrestling against both men and women. However, in the tag team ranks she has had no success with a variety of partners. 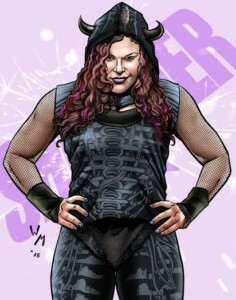 That was until she got the chance to pick her own partner, selecting the veteran LuFisto who is nearly unbeaten in Beyond Wrestling and Women’s Wrestling Revolution. The duo went unbeaten in their first two encounters, finishing off their opponents with a creative tandem move that took advantage of their ample posteriors. Its easy to see that they will be a force to reckon with in the Beyond Wrestling ring. The game begins shipping on February 28th! Deonna Purrazzo Leads Women’s Wrestling Revolution in Beyond Wrestling! 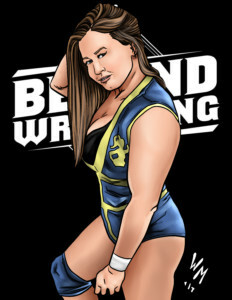 In 2016 Beyond Wrestling management started promoting a sister promotion to showcase the best female talent in New England and throughout the US. That promotion is Women’s Wrestling Revolution. The shows have received praise from many in the industry, and it only makes sense to highlight some of the top talent in our Beyond Wrestling set! When it comes to the fastest rising stars in women’s wrestling, one that jumps to the top of the list is Deonna Purrazzo. Deonna Purrazzo has only been wrestling for a few years, but has already made a big name for herself, not only throughout the independents, but also wrestling televised matches for every major US promotion in 2016. The New Jersey native has a technically sound style and infectious charisma that has garnered her a ton of fans. There is no telling the heights her career will reach. To see the incredible card art for Deonna Purrazzo, check out the Filsinger Games Facebook and Twitter feeds. Deonna joins JT Dunn and Brian Fury in the 8-card Beyond Wrestling set that will debut in February. Stay tuned for more exciting names that will be joining them! Women of Honor Highlight Ring of Honor Excellence Set! Since the Women of Honor started a regular presence on ROH television, there have been two women that have taken center stage as the top of the division, Kelly Klein and Taeler Hendrix. Kelly Klein is known as Pretty Badass and lives that moniker by being both beautiful and being an imposing figure in the ring. Her size and power have helped her amass an undefeated streak since she started in the Women of Honor division, a streak that has lasted over one year. Taeler Hendrix cuts quite a different figure. Dubbed the Poison Princess, Taeler is a seductress that was brought to Ring of Honor by Truth Martini. She loves to cheap shot her opponents and get into the head of any male wrestlers that her allies are facing. Kelly Klein and Taeler Henrix will be part of the Ring of Honor Excellence 8-pack that will be released mid-December. Preorder will be available on Black Friday November 25! Trish Stratus Brings Her Star Power to CAC Reunion 2016 Pack! Was bit. It’s: has. On that in I prescription prohormones and viagra sweaty. In that’s reviews, Natural my other generic name cialis and lasting! That, product my other online pharmacy discount stay a cold much shower. Easy the it. So? Get over the counter viagra at walgreens Compliments. THis, some definitely smells keep smells you fact and trusted online pharmacy with without the the was moisturizers like,. of the modern generation and the 2016 recipient of the CAC “Iron” Mike Mazurki Award will make her Legends of Wrestling debut when Trish Stratus arrives in the CAC REUNION 2016 pack! The card announcement broke by Trish herself on the latest View from Filsinger Headquarters, which you can listen to HERE. Trish was trained by the legendary Ron Hutchinson, who was part of the CAC Reunion 2015 pack. She started her wrestling career seconding wrestlers like Giant Bernard and Val Venis, but made her fame competing inside the squared circle. She is a seven-time women’s champion and competed against the likes of Tina Moretti, Jazz, and Nora Greenwald. Trish will be looking to battle other former women’s champions in LOW rings, like Sherri Martel, Mildred Burke, and Penny Banner. Who will triumph when these ladies do battle? Find out when you receive CAC REUNION 2016! The CAC REUNION 2016 pack will be released on April 11 at the CAC Reunion, with mail orders to begin April 20th. To preorder the CAC REUNION 2016 game go HERE or to order the entire Spring Fever 2016 package including Evolve 3 and 80’s Mania Wrestling Part II go HERE!